You used to get around 12GB of space on a 16GB iPhone, which simply isn’t enough for most people, so we were pleased when Apple bumped up the storage in the basic model of the iPhone 7 to 32GB. The company took things a step further with the introduction of the iPhone 8, which starts at 64GB. That’s a decent amount of room to grow into, but photos, music, and mysterious files can eat up all the space before you know it. That’s why, whatever model you have, it’s good to know how to free up space on your iPhone. The first place to check when you’re running low on space is Settings > General > iPhone Storage. The bar at the top allows you to see how much storage is being used and what is using it at a glance. Different categories — including Apps, Mail, Photos, Messages, and Other — are color-coded. If you scroll down in Settings > General > iPhone Storage,you can see which apps and games are using the most space. The list is organized with the largest at the top, and listed beneath each entry is the last time you used it. If you click on an app, you’ll find a breakdown of the app size and the size of the documents and data associated with it. Start by looking for apps that say Never Used and consider tapping them and selecting Delete App. It’s also worth looking for the Offload Unused Apps option at the top and tapping Enable to turn it on. This will automatically remove unused apps, but keep the documents and data associated with it, so if you reinstall an app later, you’ll retain everything you had before. 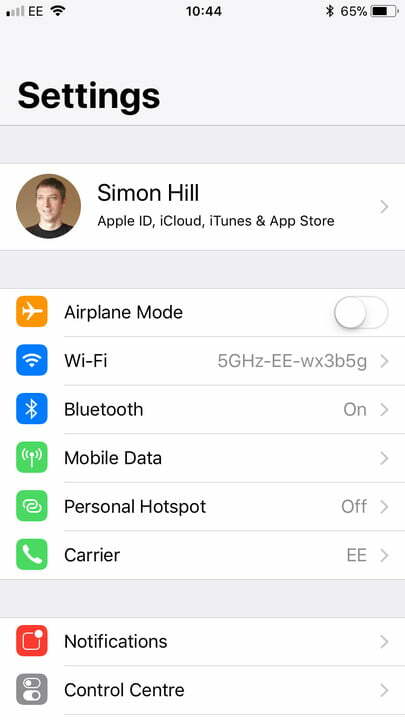 You can also find this option in Settings > [Your Apple ID] > iTunes & App Store — simply scroll to the bottom to find the toggle. 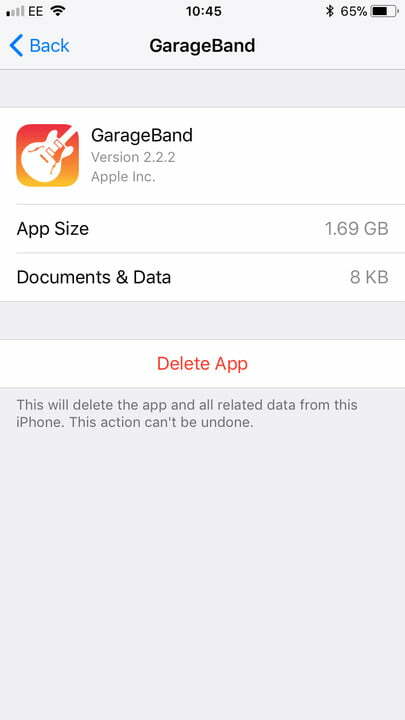 If you’re looking for additional options, check out our guide on how to delete iPhone apps. Photos and videos that you shot yourself are likely taking up a lot of space on your iPhone. It’s a shame not to take full advantage of your camera’s features, but you should turn some of them off if you’re worried about space. Start with Live Photos, because each one is a three-second video, instead of a photo. Tap the three concentric, yellow circles located at the top of the screen in the Camera app. When Live Photos are turned off, the circles should be white. 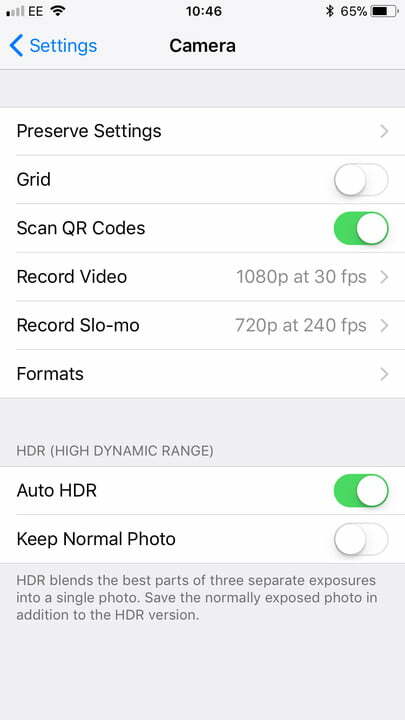 Photos are better with HDR on, but if you’re going to use the feature, then go to Settings > Camera and turn Keep Normal Photo off. Here, you can also toggle Auto HDR off, if you prefer. You should avoid recording 4K or slow-motion video if you have limited space, because both will take up a lot of storage space compared to ordinary video. You can save space by reducing the resolution and frame rate in Settings > Camera > Record Video or Record Slo-mo. A better way to cope with storage-hungry photos and videos is to back them up in the cloud. Apple’s built-in solution is iCloud. 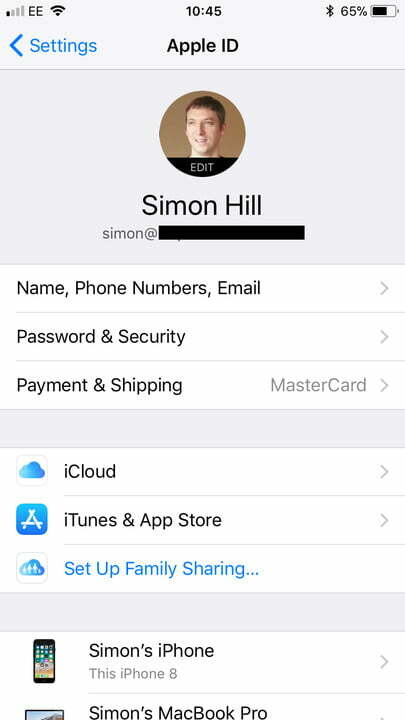 You can manage it via Settings > [Your Apple ID] > iCloud, where you’ll find a breakdown of your storage space and a list of all the apps that are currently using iCloud for backup purposes. Tap Photos and make sure iCloud Photo Library is toggled on, then tick Optimize iPhone Storage, so that full-resolution versions are replaced by optimized ones when you’re running low on space. And don’t worry — the full-resolution version will be kept in iCloud and can always be downloaded later. Thankfully, there are lots of different options beyond iCloud that will allow you to manually or automatically back up your photos and videos. We recommend Google Photos because it’s straightforward and free. You can also get some free storage space with Dropbox or OneDrive. Consult our roundup of the best free cloud storage apps for more ideas. Forget about downloading music, TV shows, or movies onto your iPhone. Use streaming services instead. Spotify and Netflix are our favorites, but there are loads of other to choose from. Apple Music and SoundCloud are great for music lovers, while Amazon Video, Hulu, and HBO Go make the perfect companion for those looking for movies or TV. If you use them when you’re out and about, just make sure that you keep an eye on your data usage. You should sift through your messages and delete anything unimportant, especially if it has an attachment. 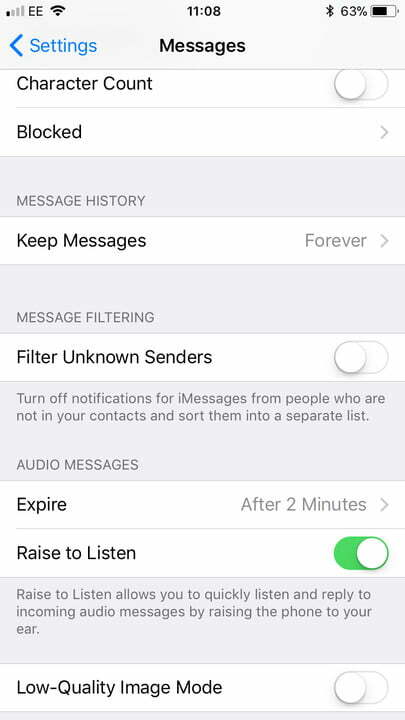 If you don’t want to go through the hassle of doing this manually, then go into Settings > Messages and scroll down to Message History and tap Keep Messages. Afterward, set it to 30 Days. It’s even worth deleting old voicemails, call history, and unused contacts. 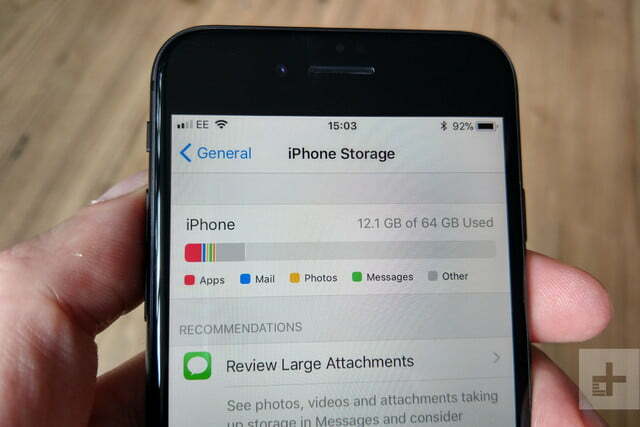 You’ll also find the option to Review Large Attachments in Settings > General > iPhone Storage, which allows you to go through them and get rid of any you don’t need . If you have any old documents, videos, or other files on your iPhone that you can’t live without, it’s time to get rid of them. Remember to look inside specific apps. Check in iBooks, for example, and get rid of anything you’ve already read. Sometimes you can end up with duplicates or old files you’ve forgotten about if you use a photo-editing app or a document scanner. 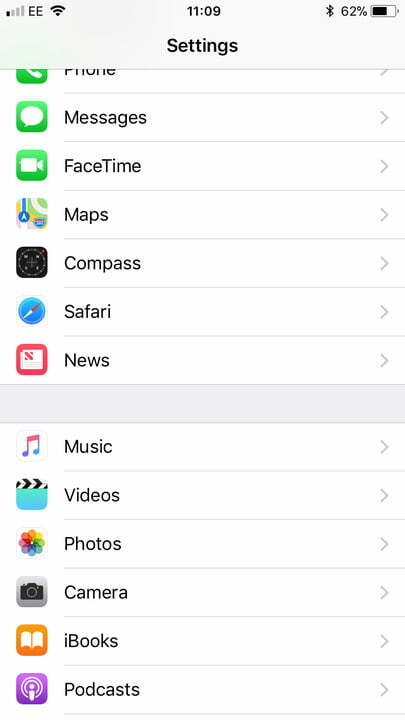 Look in Settings > [Your Apple ID] > iTunes & App Store and make sure that automatic downloads for Music, Apps, and Books & Audiobooks are turned off. If you have these turned on, then you’ll automatically download content that you bought on other devices that use the same Apple ID. We recommend leaving Updates toggled on because app updates can bring extra security and bug fixes that you don’t want to miss out on. Your browsing history and website data builds up over time, but it’s easy to get rid of. Go to Settings > Safari, scroll down, and tap Clear History and Website Data. It probably won’t make a huge difference, but if you’ve never done it before, then it could clear a decent chunk of storage. If you’ve worked through all our space-saving tips on your iPhone and you’re still short of space, there’s one last thing you can try. Back up your iPhone, wipe it, and then restore the backup. This will often reduce the size of the mysterious “Other” category listed in your storage breakdown. 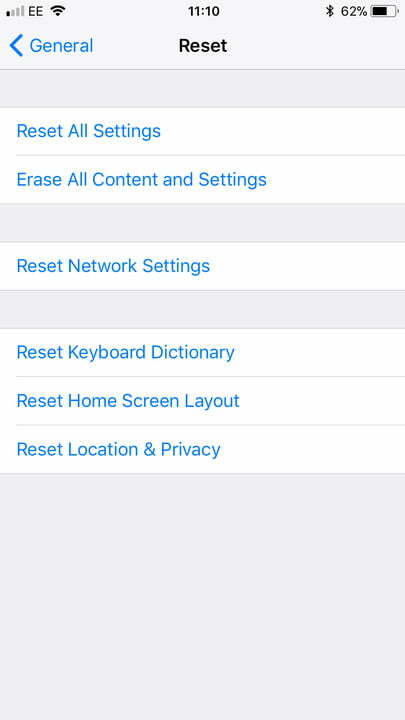 To do so, go to Settings > General > Reset and choose Erase All Content and Settings > Back Up Then Erase, or consult our guide on how to factory reset your iPhone. The latest batch of dummy “iPhone 8” and “iPhone 7 Plus” series phones have apparently made their way out of China, as a pair of videos on Wednesday offer hands-on looks at what appears to be identical device mockups. In a first video, YouTube creator Danny Winget got his hands on what he claims to be an “iPhone 7s Plus” prototype (dummy phone), though the part is almost assuredly a mockup based on leaked CAD renderings and rumors. As seen below, the “iPhone 7s Plus” dummy unit is expectedly similar to current iPhone 7 Plus hardware in terms of component positioning, bezel design and dimensions. The only obvious difference is a glass back, which appears to sport thinner antenna lines than existing iPhone models. Apple is anticipated to employ a glass chassis in all 2017 iPhone models to facilitate wireless charging. Winget goes on to compare the “7s Plus” against a supposed “iPhone 8” unit, illustrating the extreme deviation in display size and obvious aesthetic differences. While the “7s Plus” model boasts Apple’s normal thick “chin” and “forehead” bezels, the “iPhone 8” bezels are almost nonexistent. Notably, Winget’s “iPhone 8” sports white bezels, contradicting recent reports that Apple intends to limitfront face color options to black when the device launches. Whether the company plans to release a version with white bezels, as is available on certain iPhone configurations, is unclear. A second video from Techtastic, also posted today, reveals what appears to be an “iPhone 8” chassis and front screen assembly. Both the chassis and front face are done in black, consistent with recent rumors. Not much can be gleaned from the video, but it does give a sense of what the device might look like in a user’s hand. Closer inspection of Winget’s mockup and the Techtastic unit shows both dummy models are identical to parts featured in today’s image from leaker Sonny Dickson. Further, a separate “leak” on Wednesday featured a gold copper colored “iPhone 8” showing the same “CE” and battery disposal indicia. Considering the timing and apparently identical markings, each of the components seen today seem to originate from a single source. Apple is expected to debut “iPhone 8” alongside incremental changes to the iPhone 7 series at a special event in September. The new flagship smartphone is thought to include new and exotic technologies never before seen in Apple’s product line. A number of these features, including facial recognition, 3D-sensing cameras, a home button-less display, high-definition video recording, “SmartCam” photo and video capture, and more, have been all but confirmed by Apple’s inadvertent release of HomePod firmware late last month.